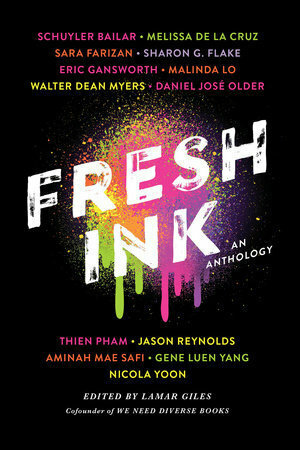 Careful--you are holding fresh ink. And not hot-off-the-press, still-drying-in-your-hands ink. Instead, you are holding twelve stories with endings that are still being written--whose next chapters are up to you. I’m not quite sure I understood the intent or the point of this short story. It was however of course well-written but too short for me to grasp its greatness. But in this case, let’s hope young love wins. Another story that’s strong point is diversity. It’s short but lengthier than the first story. An LGBTQ story that tackles the nervousness of two teens who share a love of things comic con related, but on a quick chance meeting find they like more than just their shared similarities. For its length, it was pretty entertaining and the ending was pretty adorable. This is my favorite so far. It had what the previous two didn’t have enough time to capture, that’s depth. I related to and understood the MC’s struggle. The struggle of being a person of color in a world where people don’t get that. When he mentions being darker in certain areas because he tried to scrape the color off, as a younger child—I felt that. Outstanding, and that ending—yup that’s writing right there. Another love. The painful joys of having a crush on the boy that seems unattainable. The author did a great job of capturing Shirin’s confident yet nervous personality. Thoroughly impressive and well flushed out for a short story. Another five star read. This was the most heartbreaking and current of the bunch. Gritty and raw with a sharp edge, Tags was not what I expected and would love more of. It brought to mind the recent black lives matter-esque novels recently released. I liked what he did with this one, alternating conflicting and powerful voices. Well done. A quick story on culture and acceptance. The family aspect was the best part of the story, and I’m sure this story will touch a couple of readers for its tough realness. Another LGBTQ story. Quick yet fun with a Spanish flare, would have liked more of this sci-fi tale. The writing was pretty stellar. A good fit for fans of Cassandra Clare's, The Mortal Instruments series. I liked the historical feel of this story but I honestly didn’t much understand or enjoy it. This story was a reaaacchh. It tried so hard to depict the struggles of colored people struggling against the consistent presence of racism but it failed, terribly. Not only did it feed the stereotypes it was claiming to rebuke, it was not engaging or realistic. It was unnecessarily angry and aimless. Not my favorite. Seems youthful and easy to follow but I don’t quite get the point. I know one gay man personally. He’s not transgender or anything and I didn’t know him well at first, as don’t most people when they first meet them. But I knew he was gay without him uttering a word. I just knew. It didn’t matter. He was a person who would later become my person. When he came out to me he was nervous, and cautious, and I was no one to fear. But we later laughed about it when I told him I knew and brushed him off to discuss a more impeding topic, like what we should have for lunch. It was the fact that we were still friends and that I reiterate that, that seemed more important than harping on the fact that he preferred men over women. This story was kind of like that except it didn’t capture those same realistic and intense emotions for the person coming out. But it did perfectly capture the stereotyped reactions of ignorant and non-understanding teens. It tried to emulate the process of transition and coming out but it could’ve done better in my opinion. This last story was a doozy in its intensity and in the way it’s written. Beautiful, succinct—to the point. I really would have loved to see this story fleshed out or even written as a series. This story is what I expected this anthology to capture. Great read. As a whole, the anthology attempts to teach us about diversity, to implore inclusion. While I didn't find that all of the stories did this well, some of them did, really well. I would definitely recommend even if for just some of the stories. I think this is something that should be ongoing--and is worth reading. Looks like there were some good stories and not so good, which is usually how these work. Glad you liked the majority of them though!